Abuja, Nigeria. May 27th, 2014 - Latest weekly poll results released by NOIPolls Limited and EpiAFRIC have revealed that 52% of the adult Nigerian population are unaware of cases of heart disease in their locality; hence the neglect of vital signs and risk factors resulting into incidents of heart disease by the majority. More findings have revealed that majority (67%) of the respondents stated that they have checked/measured their blood pressure in the last one year; and when asked about the result of the check, the vast majority (82%) reported that their blood pressure was normal. Only 6% stated that their blood pressure was high, 4% stated low and 8% either did not know/remember or refused to answer. The group composed of respondents of 61+ years and above (28%) had the highest proportion of respondents with high blood pressure, followed by the 46 to 60 years group with 10%. Furthermore, the BMI calculated using the height and weight scores of the 441 respondents who provided these details (44% of the total) revealed that almost half (48%) of the respondents are either overweight or obese (which are considered as risk factors for cardiovascular disease). These were the key findings from the Cardiovascular (Heart) Disease Poll conducted in the week of May 19th 2014. Cardiovascular disease (also called heart disease) is a class of diseases that involve the heart and the blood vessels or both. It is the leading cause of deaths worldwide and 80% of the burden of Cardiovascular diseases now occur in developing countries, although, since the1970s, cardiovascular mortality rates have declined in many high-income countries. At the same time, cardiovascular deaths and disease have increased at a fast rate in low- and middle-income countries. Although cardiovascular disease usually affects older adults, the antecedents of cardiovascular disease, notably atherosclerosis (narrowing of blood vessels), begin in early life, making primary prevention efforts necessary from childhood. The most common manifestations of cardiovascular disease are coronary artery disease; leading to high blood pressure, heart failure, cerebrovascular disease - disease of blood vessels that supply blood to the brain such as stroke, peripheral arterial disease - disease of blood vessels that supply blood to the arms and legs etc. The common terms used terms for these are “Heart Attack”, “Stroke” and “Hypertension”. The World Heart Federation, on examining all current research, concludes that several risk factors for cardiovascular disease are modifiable, meaning they can be changed, treated, or removed. These include high blood pressure (hypertension), obesity, tobacco use, physical inactivity, high blood cholesterol levels etc. Individuals can reduce their risk of heart disease by controlling as many risk factors as possible through lifestyle changes. There is therefore increased emphasis on prevention by decreasing one’s exposure to known risk factors by means of healthy eating, exercise, and avoidance of tobacco. Against this background, NOIPolls and EpiAfric have partnered to conduct a poll on the issue of cardiovascular disease. Using a questionnaire that was jointly designed by EpiAfric and NOIPolls, we collected data from 1,000 Nigerians. The objective of the poll was to understand the risk of cardiovascular disease in Nigeria. This was done by measuring the exposure of Nigerians to known risk factors of cardiovascular disease. To read full report please click here. The first question sought to measure the awareness of Nigerians on cardiovascular disease. Respondents were asked: Are you aware of heart (cardiovascular) disease in your locality? Responses revealed that almost half (48%) of the adult Nigerian population are familiar with heart disease. The level of awareness was equally high for both genders. 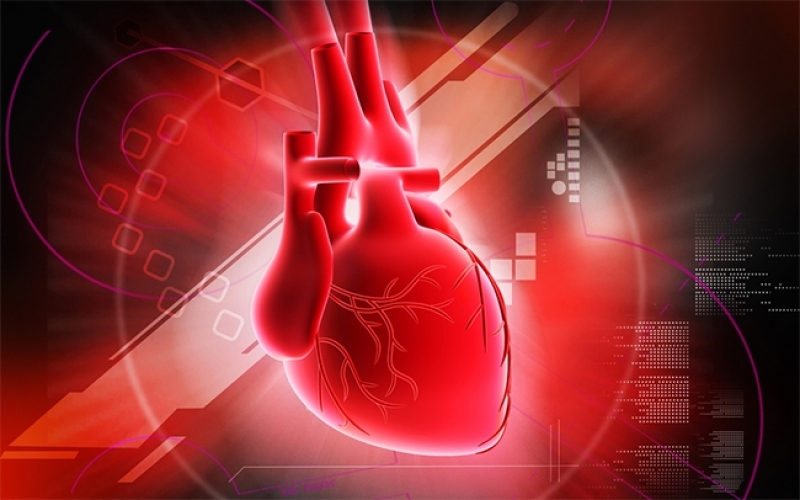 The majority of respondents (52%) however were not aware of cardiovascular disease. The highest level of awareness on cardiovascular disease was expressed by respondents from the North-East zone (65%), senior citizens aged 61+ (63%) as well as teenagers and young adults who are 18-21 years of age (60%). The second question aimed to gauge the level of concern of Nigerians on heart disease. Respondents were asked: Are you worried that you may personally be at risk of having heart (cardiovascular) disease? The majority (77%) of Nigerians are not concerned about personally being at risk of having cardiovascular disease and this cuts across gender, all geopolitical zones and age-groups. Respondents from the North-West, South-South and South-West zones (81% each) were least concerned, while respondents from the North-East (36%) zone (with the highest level of awareness on heart disease) showed more concern of being at risk of having heart disease. Similarly respondents aged 18-21 years (10%) with a relatively high level of awareness on the subject were least worried of personally being at risk of having the disease. High blood pressure (hypertension) has been identified by the World Health Organisation as one of the major risk factors of cardiovascular disease. High blood pressure increases the risk of heart disease, heart attack, and stroke. With the aim of assessing the proportion of Nigerians who have checked or measured their blood pressure in the past 1 year, respondents were asked: Have you checked/measured your blood pressure in the last 1 year? Two-thirds (67%) of the respondents claimed they have checked/measured their blood pressure in the last 1 year with the highest recorded in the South-South zone (78%). This could either be deliberate or as part of the procedures during a visit to a health facility. The proportion of Nigerians who had their blood pressure measured in the last one year increased with age. The 18-21 years age-group (54%) had the smallest and the 61+ years age-group had the largest proportion (81%). Subsequently, respondents who claimed they have checked/measured their blood pressure in the past 1 year (67% of the total) were asked: What was the value of your blood pressure the last time you measured? The vast majority (82%) of them, irrespective of gender, age or geopolitical zones, confirmed their blood pressure was at normal level. 6% reported their blood pressure as high at the time it was measured and 4% claimed it was low. In addition, while 7%refused to disclose their blood pressure level, 1% of the respondents did not remember the value. In order to further explore the exposure of Nigerians to risk factors of cardiovascular disease, the BMI of respondents were determined through information on the height and weight values of respondents; 44% of the respondents provided information on their height and weights. The BMI is calculated by dividing the weight in kilogram by the square of height in meters (kg/m2). A BMI below 18.5 is interpreted as underweight, 18.5 - 24.9 as normal weight, 25.0-29.9 as overweight and 30.0+ as obese. Almost half of respondents (48%) were classified as either overweight (25%) or obese (23%). 37% of the respondents were found to have normal weight while 15% were found to be underweight. 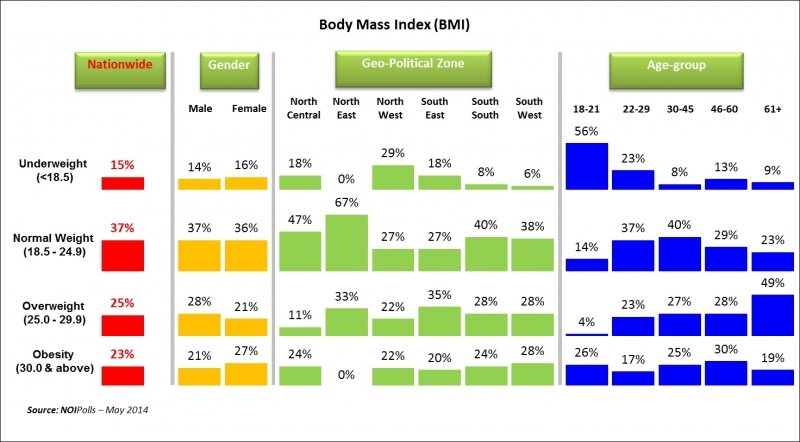 The North-East zone (67%) has the highest proportion of respondents with a normal weight, the South-West (56%: 28%+28) and South-East (55%: 35%+20%) zones accounted for the highest total proportion of respondents who are either overweight or obese, while the North-West zone(29%) accounted for the highest proportion of respondents who are underweight. Analysis based on age revealed that the majority of respondents aged 18-21 years (56%) are underweight, while the majority of respondents aged 46-60 years (58%: 28%+30%) and 61 years and above (68%: 49%+19%) are either overweight or obese. In conclusion, the heart disease poll has revealed that about half of the adult Nigerian population (52%) are unaware of incidents of heart disease in their locality, leaving 48% aware. Of those aware, the highest level of awareness was expressed by respondents from the North-East zone (65%) and by senior citizens aged 61+ (63%). Findings also revealed that the majority (77%) of Nigerians are not concerned about personally being at risk of having heart disease, and this cuts across gender. Two-third (67%) of the respondents claimed that they have checked/measured their blood pressure in the last 1 year, with an increase of proportion with age. The vast majority (85%) of respondents, irrespective of gender, age or geopolitical zones, stated that their blood pressure was at normal, and 6% reported their blood pressure as high. Respondents aged 61+ (28%) had the highest proportion with high blood pressure. Furthermore, an evaluation of the BMI calculated using the height and weight of respondents revealed that in total, about half of respondents (48%) are either overweight (25%) or obese(23%) thus exposing them to an increased risk of heart disease. Finally, the poll has established that, although many Nigerians are exposed to one or more risk factors of cardiovascular disease, the majority do not think that they are personally at risk of the disease. Our findings suggest that Nigerians may not fully understand that some lifestyle habits are also risk factors for cardiovascular disease. The increase in cardiovascular diseases in countries that still have a large burden of infectious diseases has been described as the “double burden” of disease that threatens to overwhelm the health services of many resource-poor countries. As Nigeria continues to grapple with its large burden of TB, HIV, Malaria and other communicable diseases, it is important to also focus on the increasing burden of chronic diseases such as cardiovascular disease. The opinion poll was conducted in May 19th to 20th 2014. It involved telephone interviews of a random nationwide sample. 1,000 randomly selected phone-owning Nigerians aged 18 years and above, representing the six geopolitical zones in the country, were interviewed. With a sample of this size, we can say with 95% confidence that the results obtained are statistically precise - within a range of plus or minus 3%. 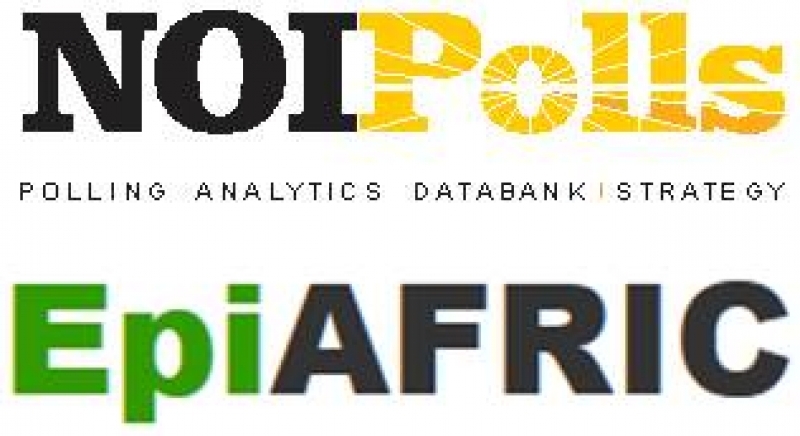 NOIPolls Limited, No.1 for country specific polling services in West Africa, which works in technical partnership with the Gallup Organisation (USA), to conduct periodic opinion polls and studies on various socio-economic and political issues in Nigeria. More information is available at www.noi-polls.com. This report has been produced by NOIPolls Limited in collaboration with EpiAFRIC to provide information on cardiovascular disease among Nigerians. NOIPolls and EpiAFRIC hereby certifies that all the ideas expressed in this document accurately reflect the answers provided by the respondents surveyed for the poll. Background information is based on information from various sources. Whilst reasonable care has been taken in preparing this document, it cannot be guaranteed that this report does not contain any errors. Any ratings, forecasts, estimates, opinions or views herein constitute a judgment as at the date of this document. If the date of this document is not current, the views and content may not reflect current findings and/or thinking of NOIPolls and EpiAFRIC.